Branch River has long been exploring the ways that EPS foam can help builders operate more efficiently. We offer our own Branch River Products to help in different parts of your construction project. Whether it be insulating your slab on grade foundation, or insulating your roof, Branch River can help you from the ground up. The Branch River Air-Flo panel is a Structural vented panel that has been tested and engineered for up to a 5' span at a 12 1/4" thickness. 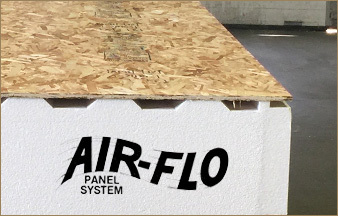 The Air-Flo Panel offers the insulation of a Structural Insulated Panel with the venting to provide you with a cold roof. Report available upon request. Hit the ground running on your construction project with a Fast Form Foundation. Fast Form can be completed in one day, reducing concrete use and labor costs. Once construction is finished, EPS insulation prevents heat loss, also saving property owners money. 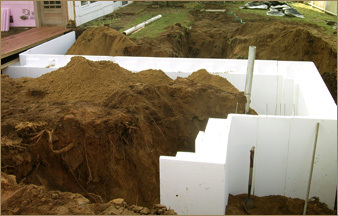 Cross one worry off your construction list with a Fast Form Foundation System from Branch River. Call Branch River Plastics today to discover the diversity of uses for Foam Control EPS!